Pictured from TCU/IAM are National Vice President and Carmen General President Rich Johnson, TCU/IAM National Representative Ray Grygiel and TCU/IAM Assistant National Representative Bob Keppen: from CN; Director of Labor Relations Tom Sullivan, Labor Relations Manager Karen McCarthy and US Southern Region Mechanical Officer Darrell Hoyt. 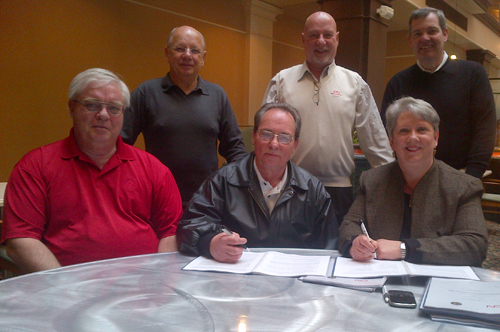 Canadian National (CN) and the TCU/IAM Carmen Division released the agreement of rules. This agreement includes all revisions from the various CN railroads through March of 2013. Click here to view the full agreement.